^ 3.0 3.1 Bushman (2005, pp. 9, 30); Smith (1832, p. 1). ^ 6.0 6.1 Bushman (2005, p. 30). ^ 7.0 7.1 Bushman (2005, pp. 32–33). From about 1818 until after the July 1820 purchase, the Smiths lived in a log home adjacent to the property. Id. ^ 8.0 8.1 Shipps (1985, p. 7); Remini (2002, p. 1). ^ 9.0 9.1 Bushman (2005, pp. 36–37) (noting the great revival of 1816 and 1817); Vogel (2004, pp. 27, 30) (noting Palmyra revivals in 1817 and 1824–5); Quinn (1998, p. 136) (evidence of religious revivals during 1819–20 in Palmyra and surrounding communities). ^ Brooke (1994, p. 129) ("Long before the 1820s, the Smiths were caught up in the dialectic of spiritual mystery and secular fraud framed in the hostile symbiosis of divining and counterfeiting and in the diffusion of Masonic culture in an era of sectarian fervor and profound millenarian expectation."). ^ Bushman (2005, p. 37) (pointing to the aftereffects of the 1817 revival); Vogel (2004, pp. 26–7) (that around 1817 Smith was beginning to feel his own religious stirrings); D. Michael Quinn (December 20, 2006). "Joseph Smith's Experience of a Methodist "Camp-Meeting" in 1820". Dialogue: A Journal of Mormon Thought. p. 3. http://www.dialoguejournal.com/wp-content/uploads/2010/04/QuinnPaperless.pdf. (arguing that a Methodist camp meeting in June 1818 provided a local context for the statement from Smith's "earliest autobiography"). ^ Quinn (1998, p. 31); Hill (1977, p. 53) ("Even the more vivid manifestations of religious experience, such as dreams, visions and revelations, were not uncommon in Joseph's day, neither were they generally viewed with scorn."). ^ Quinn (1988, pp. 14–16, 137). ^ Bushman (2005, pp. 38–9) (Saying that Smith had two questions on his mind: which church was right, and how to be saved); Vogel (2004, p. 30) ("Joseph's first vision is preceded by Bible reading and a sudden awareness of his sins"); Quinn (1998, p. 136) (saying that Joseph was concerned with obtaining a forgiveness of sins); Brodie (1971, p. 21) (Smith wrote that he was troubled by religious revivals and went into the woods to seek guidance of the Lord); Remini (2002, p. 37). ^ Brodie (1971, pp. 23, 25)(Noting that there is no evidence that Smith told anyone of his vision. Though Smith reported feeling persecuted by clergy over his vision, Palmyra newspapers took no notice of Joseph's vision at the time it was supposed to have occurred); Bushman (2005, p. 41) (Saying that at first Joseph was reluctant to talk of his vision, though he did tell a preacher, who reacted quickly and negatively, widening the gulf between Joseph and the evangelical ministry); Remini (2002, p. 40) ("The clergyman, Joseph later reported, was aghast at what he was told and treated the story with contempt. He said that there were no such things as visions or revelations...that they ended with the Apostles); Quinn (1998, p. 137) ("As a young man, he confided the experience to a few"); Vogel (2004, p. 30); Roberts (1902, vol. 1, ch. 1, p. 5) (Smith said he told his mother he had learned that Presbyterianism was not true). ^ Quinn (1987, p. 173); Bushman (2005, pp. 49–51); Persuitte (2000, pp. 33–53). ^ Smith et al. (Richards, p. 5) (writing that he "displayed the weakness of youth and the corruption foibles of human nature, which I am sorry to say, led me into divers temptations to the gratification of many appetites offensive in the sight of God," deletions and interlineations in original); Quinn (1998, pp. 136–38) (arguing that Smith was praying for forgiveness for a sexual sin to maintain his power as a seer); Bushman (2005, p. 43) (noting that Smith did not specify which "appetites" he had gratified, and suggesting that one of them was that he "drank too much"). ^ Smith et al. (Richards, p. 4). ^ Mormon historian Richard Bushman argues that "the visit of the angel and the discovery of the gold plates would have confirmed the belief in supernatural powers. For people in a magical frame of mind, Moroni sounded like one of the spirits who stood guard over treasure in the tales of treasure-seeking." Bushman (2005, p. 50). ^ Quinn (1998, pp. 163–64); Bushman (2005, p. 54) Stories circulated about Smith not bringing the "right person" required by the angel. Presumably the "right person" was originally Smith's brother Alvin, then when he died, someone else. "Other stories have the angel warning Joseph about greed, and the evildoings of the money-diggers, as if the messenger was moving him away from his treasure-hunting ways. The danger of treating the plates as treasure was underscored time after time." ^ Bushman (2005, p. 53). ^ Bushman (2005, pp. 60). ^ Harris (1859, p. 167); Bushman (2005, p. 61). ^ Bushman (2005, pp. 54) (treasure seer Sally Chase attempted to find the plates using her seer stone). ^ Bushman (2005, pp. 62–63); Walker (1986, p. 35); Remini (2002, p. 55) (Harris' money allowed Smith to pay his debts); Smith (1853, p. 113); Howe (1834). ^ Newell & Avery (1994, p. 2). ^ Bushman (2005, p. 63); Remini (2002, p. 56); Roberts (1902, p. 19);Howe (1834, pp. 270–71) (Smith sat behind a curtain and passed transcriptions to his wife or her brother). ^ Bushman (2005, p. 63) (Harris had a vision that he was to assist with a "marvelous work");Roberts (1902, p. 19) (Harris arrived in Harmony in February 1828); Booth (1831) (Harris had to convince Smith to continue translating, saying, "I have not come down here for nothing, and we will go on with it"). ^ Bushman (2005, pp. 63–64) (the plan to use a scholar to authenticate the characters was part of a vision received by Harris; author notes that Smith's mother said the plan to authenticate the characters was arranged between Smith and Harris before Harris left Palmyra); Remini (2002, pp. 57–58) (noting that the plan arose from a vision of Martin Harris). According to(Bushman 2005, p. 64), these scholars probably included at leastLuther Bradish in Albany, New York (Lapham 1870),Samuel L. Mitchill of New York City ((Hadley 1829); Jessee 1976, p. 3), and Charles Anthon of New York City(Howe 1834, pp. 269–272). ^ Bushman (2005, pp. 64–65); Remini (2002, pp. 58–59). ^ Howe (1834, pp. 269–72) (Anthon's description of his meeting with Harris, claiming he tried to convince Harris that he was a victim of a fraud). But see Vogel (2004, p. 115) (arguing that Anthon's initial assessment was likely more positive than he would later admit). ^ Roberts (1902, p. 20). ^ These doubts were induced by his wife's deep skepticism. Bushman (, p. 66). 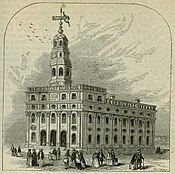 ^ During this dark period, Smith briefly attended his in-laws' Methodist church, but one of Emma's cousins "objected to the inclusion of a 'practicing necromancer' on the Methodist roll," and Smith voluntarily withdrew rather than face a disciplinary hearing. (Bushman 2005, pp. 69–70). ^ Smith (1853, p. 126). ^ Bushman (2005, p. 74) (Smith and Cowdery began translating where the narrative left off after the lost 116 pages, now representing the Book of Mosiah. A revelation would later direct them not to re-translate the lost text, to ensure that the lost pages could not later be found and compared to the re-translation); Bushman (2005, p. 71) (Cowdery was a school teacher who had previously boarded with the Smith family.) He may have also been a dowser Hill (1977, p. 86) (Cowdery had brought with him a "rod of nature," perhaps acquired while he was among his father's religious group in Vermont, who believed that certain rods had spiritual properties and could be used in divining. "); Bushman (2005, p. 73) ("Cowdery was open to belief in Joseph's powers because he had come to Harmony the possessor of a supernatural gift alluded to in a revelation..." and his family had apparently engaged in treasure seeking and other magical practices); Quinn (1998, pp. 35–36, 121). ^ Quinn (1994, pp. 5–6, 38) (contrasting the 1829 view with the churchless Mormonism of 1828); Bushman (2005, pp. 74–75). ^ Quinn (1994, pp. 15–20) (noting that Mormon records and publications contain no mention of any angelic conferral of authority until 1834); Bushman (2005, p. 75). ^ Bushman (2005, p. 77) (Smith "began to seek converts the question of credibility had to be addressed again. Joseph knew his story was unbelievable."). ^ (Bushman 2005, pp. 77–79). There were two statements, one by a set of Three Witnesses and another by a set of Eight Witnesses. The two testimonies are undated, and the exact dates on which the Witnesses are said to have seen the plates is unknown. ^ Smith et al. (Richards, p. 8). ^ Bushman (2005, p. 82). ^ (Bushman 2005, p. 80) (noting that Harris' marriage dissolved in part because his wife refused to be a party, and he eventually sold his farm to pay the bill. ^ Scholars and eye-witnesses disagree whether the church was organized in Manchester, New York at the Smith log home, or in Fayette at the home of Peter Whitmer. Bushman (2005, p. 109); Marquardt (2005, pp. 223–23) (arguing that organization in Manchester is most consistent with eye-witness statements). ^ Brodie (1971, pp. 80–82). 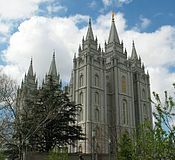 ^ Bushman (2005, p. 117)(noting that area residents connected the discovery of the Book of Mormon with Smith's past career as a money digger);Brodie (1971) (discussing organized boycott of Book of Mormon by Palmyra residents, p. 80, and opposition by Colesville and Bainbridge residents who remembered the 1826 trial, p. 87). ^ Bushman (2005, p. 121); Phelps (1833, p. 67) ("[N]o one shall be appointed to receive commandments and revelations in this church, excepting my servant Joseph, for he receiveth them even as Moses."). ^ Phelps (1833, p. 68) ("[I]t is not revealed, and no man knoweth where the city shall be built."). ^ Phelps (1833, p. 68) ("The New Jerusalem "shall be on the borders by the Lamanites. "); Bushman (2005, p. 122) (church members knew that "on the borders by the Lamanites" referred to Western Missouri, and Cowdery's mission in part was to "locate the place of the New Jerusalem along this frontier"). ^ Phelps (1833, pp. 67–68) (Cowdery "shall go unto the Lamanites and preach my gospel unto them".). ^ Brodie (1971, p. 96) (noting that this was the third time Smith had revealed "lost books" since the Book of Mormon, the first being the "parchment of John" produced in 1829, and the second the Book of Moses dictated in June 1830. ^ Bushman (2005, p. 124); Roberts (1902, pp. 120–124). ^ F. Mark McKiernan, "The Conversion of Sidney Rigdon to Mormonism," Dialogue: A Journal of Mormon Thought, 5 (Summer 1970): 77. 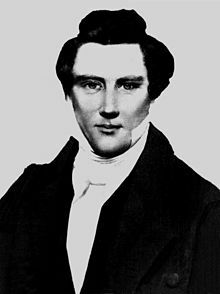 Parley Pratt said that the Mormon mission baptized 127 within two or three weeks "and this number soon increased to one thousand." McKiernan argues that "Rigdon's conversion and the missionary effort which followed transformed Mormonism from a New York-based sect with about a hundred members into one which was a major threat to Protestantism in the Western Reserve." ^ Brodie (1971, p. 96) ("When Rigdon read the Book of Enoch, the scholar in him fled and the evangelist stepped into the place of second in command of the millennial church."). ^ Brodie (1971, p. 97) (citing letter by Smith to Kirtland converts, quoted in Howe (1833, p. 111)). In 1834, Smith designated Kirtland as one of the "stakes" of Zion, referring to the tent–stakes metaphor of Isaiah 54:2. ^ Phelps (1833, pp. 79–80) ("And again, a commandment I give unto the church, that it is expedient in me that they should assemble together in the Ohio, until the time that my servant Oliver Cowdery shall return unto them. "); Bushman (2005, pp. 124–25); Brodie (1971, p. 96) (noting that Rigdon had urged Smith to return with him to Ohio). ^ 原文：Oh Lord, my God!